Offers improved sound for seniors with significant hearing loss but those with moderate vision loss may need an easier to read model. To be honest, this cordless phone is a lot like the others. But I am including it on my list of recommendations for one main reason. It doesn’t look like a phone made especially for the elderly. Some seniors are sensitive to anything that looks medical or modifies because of any disabilities they may have. This phone looks like most any other cordless phone. But, it has several features that are helpful to seniors. Incoming sound is boosted up to 40 dB which is a pretty high level for a phone in this price range. There is a choice of 10 different ring tones plus 6 different ringer volumes. This range of options should most any senior hear the ringer. This one has the talking caller ID that announces the name of the incoming caller. Also, the keypad that lets you know who is calling as well as what buttons you are pushing. The buttons on this phone are larger than a standard cordless phone but they aren’t quite as big as some of the others I have reviewed. The call and hangup buttons are color coded for easy viewing and understanding. There are 4 one-touch memory buttons right on the cordless phone receiver. There is no really good way to label them though. So, the senior would need to memorize which button calls which person. Overall, I like this cordless phone for seniors. It is an especially good choice for seniors with moderate hearing loss and mild to moderate vision loss. 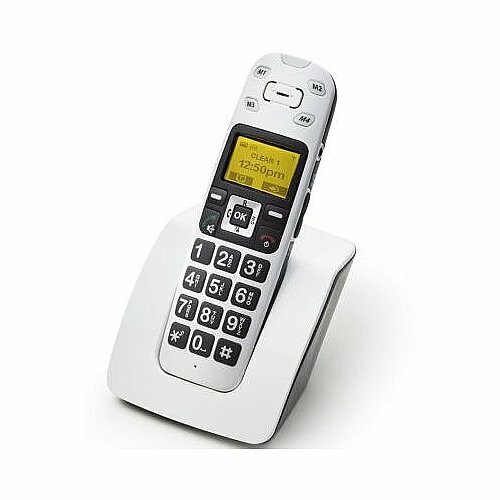 Seniors with low vision may need a cordless phone with bigger buttons that have more contrasted printing on them.